Occupy D.C. is nearing its end. Over the weekend, the National Park Service informed the occupiers of McPherson Square in downtown Washington that it would begin enforcing a ban on “camping” at noon on Monday, January 30. That meant no more eating and sleeping in the park—in other words, no more occupation. The “High Noon USA Park Police Showdown,” as one banner put it, didn’t materialize midday Monday, but judging from the assembled Park Police surrounding the park, it won’t be long until it does. Some campers anticipate a midnight eviction, a la Zuccotti Park. But either way, McPherson Square will soon be empty. But though the protest is only just now being dismantled, its eulogy could have been written months ago. The movement’s inability to gain traction in Washington was evident soon after its launch. Occupy D.C. may have outlasted Occupy Wall Street, but it was never as evocative or influential. The protest in Zuccotti Park, stationed next to Wall Street, was a jolting reminder of corrosive income inequality, but the Occupy D.C. encampment stagnated into a sort of monument to itself. What it lacked in galvanized youth, Occupy D.C. made up for in semi-professional activists. (The concurrent Stop The Machine movement, an off-shoot of ODC, was almost entirely run by veteran protesters.) There is nothing wrong with this, of course. But part of what made Occupy Wall Street so refreshing was that, amidst “End the Fed” Ron Paulites and steadfast Zizekians, one found recent college graduates and unemployed family men, dissenting for the first time. At McPherson Square, however, the occupiers were not everyday people radicalized by events. They were permanent dissenters, the people who never believed in politics and elite institutions to begin with. When it comes to the people who make up a protest movement, there is an important difference between the radical and the radicalized. 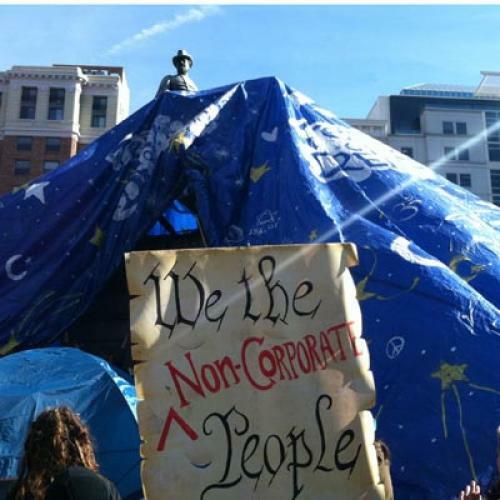 Occupy D.C. will not go down with merely a whimper. Today, occupiers defiantly pitched a gigantic “tent of dreams” atop the park’s statue of James McPherson, leaving only the head and torso of the Civil War General peeking out. (On the lookout, we assume, for Park Rangers.) “This is what democracy looks like!” they chanted. When the inevitable eviction takes place, much of the camp will resist, but the park will be cleared. It is a sign of both the movement’s strength and its weakness that there will be no serious reason to mourn. Income inequality, an issue that once mattered only to earnest liberals, is now openly discussed by both parties. It may even prove to be the issue that frames the next presidential election. “Occupy” and “99 percent” have permanently infiltrated not only the country’s political lexicon, but its imagination and conversation too. That is what democracy looks like. Nathan Pippenger and Simon van Zuylen-Wood are reporter-researchers at The New Republic.